AeroSuperBatics Ltd is a British aerobatics and wingwalking team. 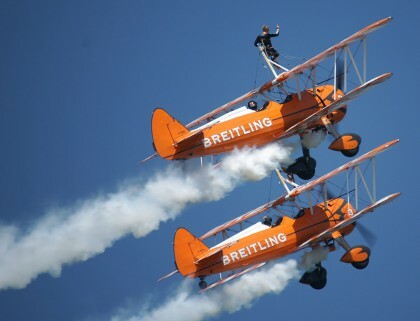 As of 2011, they perform as the Breitling Wingwalkers following a sponsorship agreement with the Swiss watch manufacturer Breitling. AeroSuperBatics was founded in 1989 by Vic Norman, a veteran aerobatics pilot. It operates four Boeing-Stearman Model 75 biplanes and employs five pilots. The team’s shows consist of two or four planes performing aerobatic manoeuvres while female athletes, attached to a post above the wings, engage in acrobatics.